Cubs hang on Sunday night with an 8 out save from Aroldis Chapman. 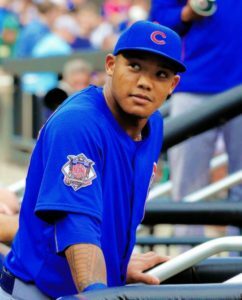 Chapman came in for the save in the 7th inning which is earlier than usual, but Cubs manager Joe Maddon felt Chapman was fresh and could handle a longer night (which he did). Cubs avoided elimination and are now down 2-3 with the best of seven Series back in Cleveland Tuesday night. Cubs 3, Indians 2. Terry Francona, the Indians Manager has a notorious gum habit (he keeps a bucket of game near him during games and is always chomping away) and an intense sweet tooth. After Cleveland’s game 4 win, Francona had trouble sleeping so at 3:30 in the morning he ordered $44 worth of ice cream from room service. 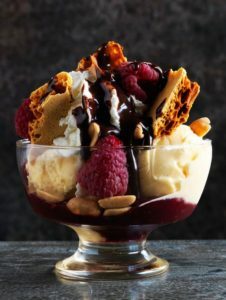 According to a tweet from a reporter from Cleveland.com, he ordered: 2 orders of chocolate, 2 orders of vanilla ice cream with chocolate sauce and diet coke. And to keep it healthy, he added berries. The Dallas Cowboys came from 10 points down in the fourth quarter to force an overtime against the Philadelphia Eagles. Cowboys rookie quarterback Dak Prescott threw a touchdown to Jason Witten for a 29-23 win. In Seattle, safety Earl Thomas had an opposite reaction to an official. After he recovered a New Orleans’ fumble for a touchdown, Thomas handed the ball to a fan then ran and hugged the side judge. It was an enthusiastic response, but unfortunately for the Seahawks, they were charged with a 15 yard penalty as the NFL prohibits any contact with officials. Saints 25, Seahawks 20. Russell Westbrook became the first player in NBA history to hit at least 100 points, 30 rebounds and 30 assists in the first three games of the season. Westbrook’s intensity helped his Oklahoma City Thunder beat the Lakers 113-96. DeMarco Murray and Derek Henry had a big day combining for over 180 yards in Tennessee’s win over their AFC South division rivals Jacksonville Jaguars in Thursday Night Football. The Titans are now 4-4 and only 1/2 game out of first place in the division while the Jags are in last place at 2-5. Titans 36, Jaguars 22. In some tough news for the Broncos, their star running back C.J. Anderson is out indefinitely with a meniscus tear. The Chicago Cubs and Cleveland Indians face off tonight in game 3 of the World Series, but that didn’t stop the Cubs from taking time to make fun of their ace hitter Kyle Schwarber. 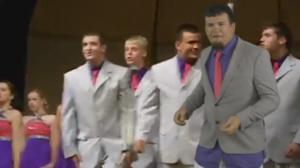 Schwarber’s teammates dressed up and superimposed a video of them singing and dancing to one of Schwarber’s high school holiday concerts when he was a member of the show choir. In game 2 of the World Series, Cubs pitcher Jake Arrieta threw a no hitter through 6 innings to help bring them a big win in Cleveland. The Cubs also relied on newly healthy Kyle Schwarber. 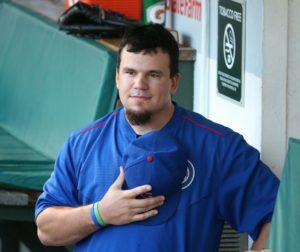 Schwarber had knee surgery in April and was expected to be out all season, but he worked hard in rehab and was cleared a few weeks ago by the doctors. He then called the Cubs head of baseball operations, Theo Epstein and begged for a chance to play. Epstein said. “I think anyone who saw how hard he was working behind the scenes for six months would have given him that chance.” After a crash course in training (including 1300 pitches from a pitching machine), the team felt he was ready. Last night he proved it by hitting 2 RBI’s and getting a walk to help the Cubs win 5-1 and even the series. The series now heads to Chicago tied at 1-1. Next game Friday night 8:00 pm ET. It was an emotional night for “rookie” Joel Embid of the Philadelphia 76ers. Embid was drafted 3rd overall in 2014 but didn’t play due to surgeries on his right foot. Last night against the Oklahoma City Thunder, Embid wowed the crowd with 20 points and 7 rebounds in his pro debut. Even though the Sixers lost 103-97, the crowd was clearly energized by Embid and never stopped chanting “trust the process”. In other Sixers news, their scheduled National Anthem singer Sevyn Streeter, was pulled minutes before heading out on the court to sing. Streeter was told she couldn’t sing because her shirt said “We Matter”. 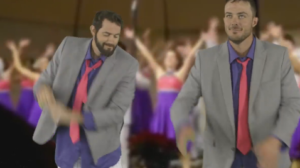 Streeter was replaced by one of the Sixers Dancers. The Sixers organization hasn’t commented on the matter, but it was only a few days ago during the team’s pre-season game in Miami where another singer opened her jacket to reveal a “Black Lives Matter” tshirt and knelt while singing the National Anthem. Indians get the win in game 1 of the World Series with a 6-0 shutout against the Chicago Cubs. 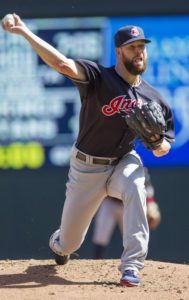 Corey Kluber, nicknamed Klubot for his robotic approach to his pitching, dazzled the crowd with eight strikeouts in 3 innings (a record in post season play). Kluber threw for 88 pitches but should have enough in him to start in game 4. Game 2 is 7:00 pm ET Wednesday October 26th. The much anticipated season debut for the Golden State Warriors was disappointing for Warriors fans. The newly acquired Kevin Durant had a solid game with his new team (27 points and 10 rebounds), but his teammates didn’t back him up in a loss to the San Antonio Spurs. According to Steph Curry it was “a nice little slap in the face” especially after last seasons win streak (only losing 9 games all regular season). Spurs 129, Warriors 100. The New York Giants finally did the right thing by giving 37 year old kicker Josh Brown the boot. When allegations of Brown’s domestic abuse surfaced, the organization handed out a one game suspension, but now with new documents showing Brown admitting to abusing his wife, the team officially cut ties. Denver Broncos coach Gary Kubiak got a big welcome on his return to the field Monday night after a health scare that kept him out for a few games. It was an unwelcome return for Houston QB Brock Osweiler, however, who previously played for the Broncos but left for more money from Houston (actually $18 million vs $16 million for the season). 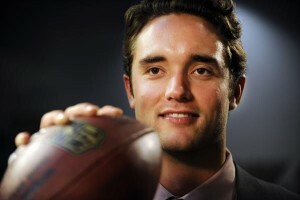 The Broncos defense made Osweiler’s night difficult limiting him to 131 yards. Broncos 27, Texans 9. The World Series begins Tuesday night with a best of seven series promising to pack drama and excitement, and the end of either the longest draught (Cubs) or the second longest drought (Indians) in major league history. Click here for the full schedule of games. Jon Lester, who was co-MVP in the NLCS series, will start game 1 for the Chicago Cubs while the Cleveland Indians will start Corey Kluber. The Chicago Cubs beat the LA Dodgers Saturday night and are now headed to the World Series to take on the Cleveland Indians. This World Series promises to be one for the ages. The Indians haven’t won the big one since 1948, while the Cubs haven’t been in the World Series for 71 years and haven’t won since 1908. The best of seven series begins Tuesday at 8:00 pm ET. In college football, the mighty Ohio State lost to Penn State 21-24 dropping them to #8 in the Coaches Poll (from a previous #2). Undefeated Alabama remains at #1, while the undefeated Michigan Wolverines jumped to #2. In the NFL, the New York Jets beat the Baltimore Ravens after QB Ryan Fitzpatrick entered the game for an injured Geno Smith. Fitzpatrick was benched last week, so when he was called back in to finish this game, he was admittedly angry. He said, “The biggest thing in this game, in order to last, is to have belief in yourself, because when the owner stops believing in you, the GM stops believing in you, and the coaches stop believing in you, sometimes all you have is yourself.” He went on to say, “I probably play better as an underdog, pissed off, so going forward, yeah, I’ll be pissed off,” Jets 24, Ravens 16. In what many consider the worst game of the weekend (and the season so far), the Seattle Seahawks and the Arizona Cardinals both missed two field goals in overtime to tie the game 6-6. The game was a yawn fest from the beginning with the Seahawks punting on their first nine possessions. The Cleveland Indians pulled out the win over the Toronto Blue Jays. With a 3-0 victory, the Indians won the American League pennant and will advance to the World Series. The Indians, who will face the winners of the NLCS Cubs/Dodgers series, haven’t won the big one since 1948. Couldn’t help but thing of the movie “Major League” about the fictional Cleveland Indians rising against the odds to winning the Pennant. 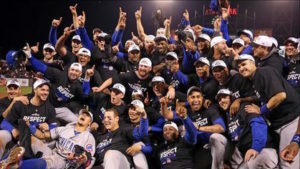 In the National League Championship Series, the Chicago Cubs overpowered the LA Dodgers to even the series 2-2. The big story of the game was Anthony Rizzo’s breakout (with a borrowed bat from Matt Szczur) from his postseason slump. According to Szczur, this isn’t the first time Rizzo has grabbed his bat. “It’s the same weight and size, just a different model. He just grabs. He did it last night and got his first hit, that broken bat single.” Cubs 10, Dodgers 2. Game 5 is tonight at 8:00 pm Et. Oakland Raiders owner Mark Davis plans to file the necessary paperwork to move his team to Las Vegas. According to reports, Las Vegas has committed $750 million to building a stadium for the team. If the move is to take place, 3/4 of the 32 NFL teams need to approve. The Toronto Blue Jays managed to stave off elimination against the Cleveland Indians in the American League Championship Series. In the third inning, Blue Jays slugger Josh Donaldson homered to lead the Jays for the first time in the series. 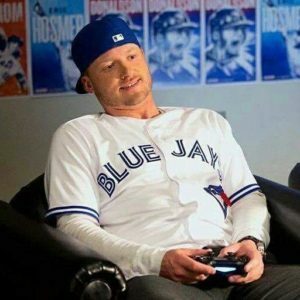 Prior to the game, Donaldson gave an emotional speech that fired up his team. He said, “it’s a must-win game, just go out and give everything you’ve got. You may not be able to play again.” Cleveland leads the series 3-1 with the next do-or-die game (for the Jays) scheduled today at 4:00. Former Chicago Cub, Rich Hill led his new team, the LA Dodgers, to a 5-0 win over the Cubs to advance to a 2-1 lead in the National League Championship Series. Hill pitched six perfect innings to help the Dodgers shut out the Cubs 6-0 (the second straight shut out for Chicago). The Cubs will try and even the series tonight at 8:00 pm. 12 time Olympic medalist and disgraced Rio swimmer, Ryan Lochte is cashing in on his “fame”. After his stint with “Dancing with the Stars”, he will appear with Sharon Stone in her new movie, “A Little Something for your Birthday”. The Cleveland Indians are one game away from sweeping the Toronto Blue Jays in the ALCS, but the headlines this morning are all about the Indian’s pitcher Trevor Bauer’s bloody pinkie finger. He cut his finger on a drone last week and was desperately trying to stop the bleeding. 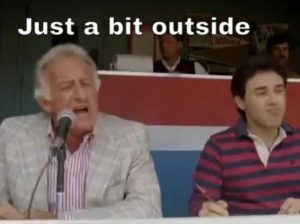 Baseball rules prevent players from wearing a bandage (claiming it’s a foreign substance), so everyone saw the drip, drip of the blood and knew he’d be coming out of the game. 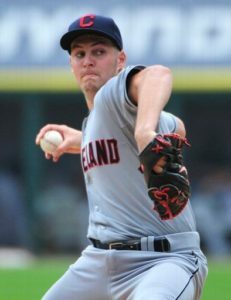 Fortunately for the Indians, they have a bullpen ready to take over and they did, rotating in 6 different pitchers to pull out a 4-2 win. The Series continues today at 4:00 pm in Toronto and if the Indians win, they move on to the World Series, marking their first World Series appearance since 1997. With the New York Jets trailing 28-3 in Monday Night Football’s matchup against the Arizona Cardinals, the Jets replaced QB Ryan Fitzpatrick with backup Geno Smith. The move was too little too late as the Jets couldn’t string any significant plays together. The Jets are now 1-5 and will have to decide which QB to start next week against a 3-3 Baltimore Ravens. Cardinals 28, Jets 3.